You’ve never volunteered like this before. How an ordinary student built schools in Honduras while studying full time in college. During freshman year at James Madison University in Harrisonburg, Virginia, Tiffany walked around alone at the campus involvement fair. She was looking for an organization where she could make new friends and help a cause. She found SHH’s table and signed up to join. “Never did I think this organization would change my life,” she later said. Tiffany attended the weekly meetings, participated in several fundraising events, and signed up to travel to Honduras for spring break. She was nervous but excited to travel with her new friends. She flew down and visited a village located on a mountainside outside of the city of El Progreso. The community was called Delicias del Sur, SHH’s newest partner. After a short hike up the steep hills, she met Digna, a community leader and mother who was helping organize the school construction project that SHH was funding. Digna invited Tiffany into her house and taught her how to make baleadas—Honduran burritos. After a successful cooking session, they sat down as Digna began telling her story over a strong cup of coffee. Digna was born in Honduras but her family moved frequently throughout Central America searching for jobs. She started the first grade and began learning to read and write with her neighborhood friends. But her schooling was cut short. That year, she dropped out to help her mother put food on the table. Every day for the next few years, Digna walked barefoot to her mother’s corner stand to help sell goods to provide an income for her family. She didn’t own shoes at the time, and Digna still remembers the burning pain she felt at the bottom of her feet from all the cut and scrapes. Digna eventually moved to Delicias del Sur where she lives with her grandchildren. She quickly became a community leader and is working hard to address the community’s challenges. More than anything, she wanted her grandchildren to have the one thing that could change everything: an education. But there was a problem. The community did not have a school. The closest one was located in another village and though there was a path, parents were reluctant to send their kids on such a long walk. Gang violence was a serious concern in the area. Yet Digna and the parents in the community did not give up. They brainstormed ways for their children to learn to read and write. Soon, an abandoned house was turned into the community’s first schoolhouse. The number of children who wanted to enroll quickly outnumbered the number of seats available inside the small house. After Digna shared her story, everyone walked over to the construction site. Tiffany worked alongside Digna that week reflecting on the community’s solidarity and commitment to education. Together with dozens of parents, she helped lay cinder blocks and mixed concrete under the hot sun. “Their humility and kindness left me speechless,” she said, as countless snacks and gifts were brought out. When Tiffany returned to campus, she was committed to raising the funds to help Digna’s community finish the project. The JMU chapter organized countless fundraising events—like selling grilled cheese late at night to students walking home from parties. Together, they raised $13,000. 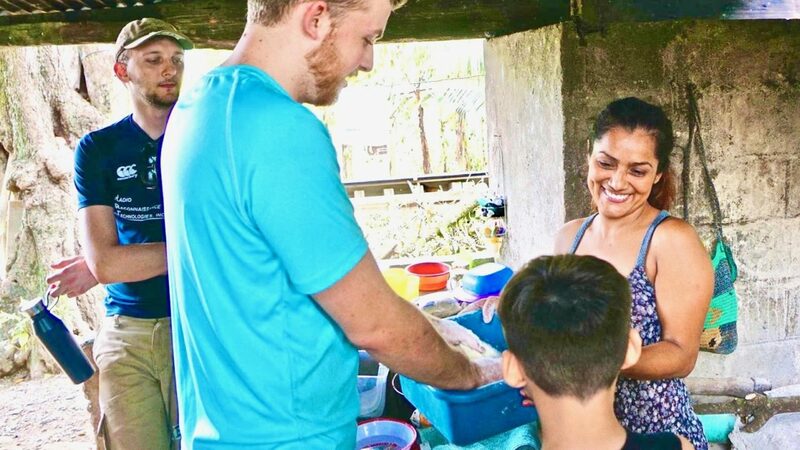 Back in Honduras, the community members worked day and night using supplies purchased with the funds. By the end of the summer, the construction was finished. The following winter, Tiffany returned to Delicias del Sur to attend the inauguration ceremony. “It is impossible to describe how I felt in that moment,” she said. Hundreds showed up. Parents spoke, children sang, and everyone celebrated. Tiffany has since returned to Honduras many times and has helped raise funds for several school projects with her chapter. She is one of more than 7,000 volunteers who have joined us in Honduras over the years. In Honduras, children from nearly 1,000 villages don’t have access to a school with the adequate facilities. You can be a part of the solution by building a school with community members. 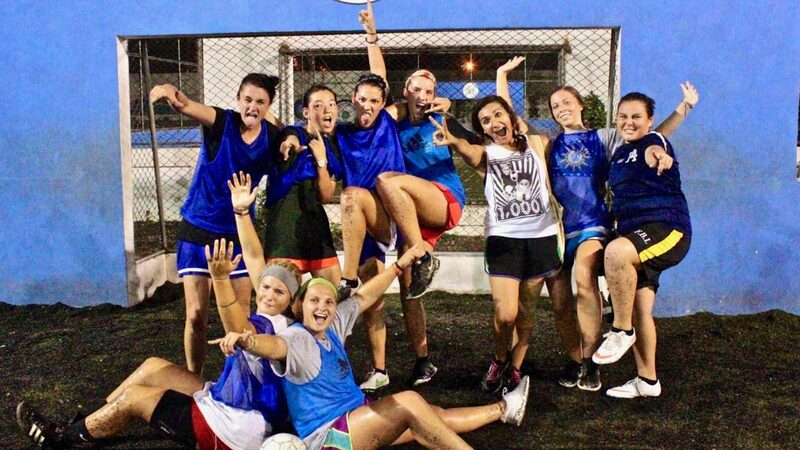 Why pay thousands of dollars to travel when you can go to Honduras with us for so much less? We also give out trip scholarships and discounts. Your fee covers all costs except for airfare. Every single one of our volunteers has gone home safely. We take the necessary measures to minimize all risks associated with traveling abroad. Your safety is our #1 priority. Every volunteer gets an online fundraising page so family and friends can help fund your trip. Our campus chapters also help volunteers fundraise through group events like car washes and benefit parties. You’ll meet the students who will attend the school you work on, as well as the families who live in Villa Soleada, where your guest house is. Our Honduran and international staff members will be with you from the moment you land at the airport. We’re here to answer any questions and make you feel at home. We are the largest student-led organization in northern Honduras and have more experience running these trips than anyone else in the region. You’ll have plenty of opportunities to practice your Spanish with the Honduran locals. Get to know community members, share meals, and spend time with the children to work on your Spanish skills. Volunteers must register and pay $150 deposit two months in advance of their trip to receive the $650 early bird price. The price is $750 for volunteers who sign up within two months of their trip. Round trip tickets to Honduras cost between $350 to $700. The airport you will be flying into is the Ramon Villeda International Airport in San Pedro Sula (SAP). two weeks before your trip’s start date. Please review our Cancellation Policies section. If you raise $1,000 for a school build OR recruit 5 new volunteers to come on a trip OR start a chapter at your school, your 8-day trip cost will be reduced from $650 to $375. If you raise $2,000 for a school build OR recruit 10 new volunteers to come on a trip, we will waive the $650 trip fee – you pay only airfare. If you are a teacher or chaperone, your 8-day trip cost will be reduced to $450 (Early Bird) or $550 (Regular Bird). If you are attending Family Week, your second family member will be reduced to $450 (Early Bird) or $550 (Regular Bird). *Discounts cannot be split or transferred. 24/7 Group Volunteering. You will be working in a group and not alone. “We’re so often fed this Western narrative that when we travel abroad for a service trip, we’re saving the lives of so many people who cannot help themselves. However, this is not the case. Students Helping Honduras thinks critically about how this organization can shift this narrative. By hiring Honduras staff, involving the communities in decision making processes, asking families to invest their time and resources into their new schools to ensure maximum buy-in, and educating its volunteers, SHH has become a one-of-a-kind organization that will make a long-term, sustainable impact. The Villa Soleada Guest House is located 15 minutes away from El Progresso, Honduras. It is located in a small, gated facility in Villa Soleada. It has 62 beds, 10 bathrooms, and a large common room where volunteers can eat and hang out. There are also books, board games, snack bar, private security, Wifi Internet, 24/7 staff members, purified water, and more. The Guest House employs parents from the area, providing valuable employment opportunities for the community. Because of SHH, some of the most influential people in my life live across the US and across the world. I’ve learned what my role is on the global stage, and I have experienced the smallest but most significant moments of my life. Work hard building a school during the day. Enjoy a game of soccer or salsa at night. Our staff members will be waiting for you at the airport and drive you to El Progreso. You will get settled into your rooms in the afternoon and eat dinner around 6pm. Orientation will follow shortly after. Spend the final day on the Caribbean beaches of Tela, just 50 minutes away from El Progreso. There will be a goodbye dinner in the evening. Time to go home. Our staff members will be taking multiple trips to the airport. 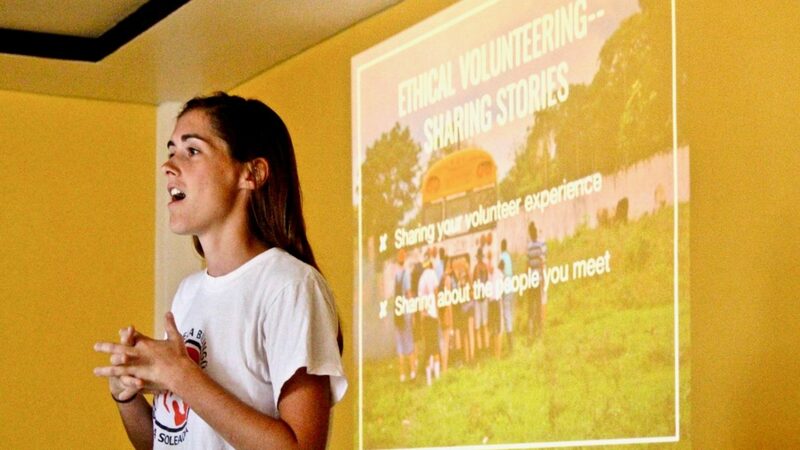 “Students Helping Honduras provided me with an ethical view of how volunteering should be conducted through their unbiased, mentorship-based discussions and encouragement of critical thinking. The typical group has 15 to 30 volunteers from all over the world. Our volunteers are mostly from the US, but we’ve hosted people from Japan, Korea, Singapore, Thailand, China, Brazil, Puerto Rico, Uganda, Canada, Australia, UK, Germany, Denmark, Belgium, France, Spain, Russia, India, Pakistan, Vietnam, Laos, Philippines, Bangladesh, Afghanistan, Turkey, Italy, Costa Rica, El Salvador, Mexico, and other countries. We accept volunteers of all ages! Our youngest volunteer to date was 6 years old. Our oldest was 90 years old. On average, our volunteers are 16-30 years of age. My name is Shin Fujiyama. I visited Honduras for the first time in 2004 while I was a student at the University of Mary Washington in Fredericksburg, Virginia. As an ordinary 20-something-year-old, I played soccer during the weekends, skipped way too many classes, and struggled to figure out my place in the world. I never imagined that a week-long trip to Honduras would spark a movement. As I started SHH out of my campus dorm room, I had no idea that development aid could be so complex. So I began reading books like John Wood’s Leaving Microsoft to Change the World. Dr. Paul Farmer’s Mountains Beyond Mountains, and William Easterly’s The White Man’s Burden to educate myself. I found countless mentors and later started a podcast show where I interview social entrepreneurs and CNN Heroes from all over the world to continue learning. Over the years, our team created an award-winning organization that supports Honduran community leaders who are fighting the challenges in their country. And througout the journey, we’ve done something that few organizations attempt: we’ve invited donors and supporters to join us on the ground – to get to know our methodology and community partners in Honduras. We spent countless hours brainstorming ways to improve the process and asked a thousand questions along the way. Are we doing projects for the community or with the community? Are we environmentally conscious? Taking away jobs or creating jobs? Promoting gender equality? Measuring our results? Minimizing safety risks? Providing adequate training to staff and volunteers? Choosing projects with the highest impact? We’ve done our best to address each of these issues and more. As a result, more than 7,000 individuals have joined us in Honduras from all over the world and together, we’ve raised more than five million dollars to support our Honduran community leaders. As we close in on our goal to build on thousand schools in Honduras, I hope you can join us in this worthwhile journey. Now that you’ve registered, you have until exactly two weeks before your trip to pay your remaining balance. Your remaining balance is payable online by logging into your emailed Trip account and page. If you wish to pay by check, please contact us. Purchase a flight to Honduras on the EXACT DATES of your trip. If you come early or leave late, you are responsible for your own transportation or accommodations. We recommend arriving before 3:00pm on the first day of the trip in order to relax for your action-packed week. Check out the section below for more information on our airport pickup policy. Fill out the mandatory Flight Information Form. Give us your flight information by filling out the Flight Information Form. This is very, very important so that we know when to pick you up! The deadline to submit your flight form is 14 days before the start date of your trip. After the deadline, a $50 late fee will be issued. This is to ensure the safety of volunteers and guarantee SHH staff will pick volunteers up from the airport. SHH provides free transportation on the day of arrival and departure from the hours of 10am and 7pm. You can arrive outside those times for a $25 transportation fee. To save on flight costs, you are also welcome to arrive a day before the trip or stay a day after for an additional $50 fee. Questions? Please email trips@shhkids.org. Make sure your passport does not expire for at least 6 more months. If it does, you will need to renew it in order to enter Honduras. If you are a US citizen, you do not need a visa. Visit your doctor and get the recommended immunizations. Make sure to check out our health section below. Make at least 3 copies of your passport. Give one to your emergency contact and carry one with you at all times while in Honduras. If your insurance doesn’t cover you while on your trip, we highly recommend the Volunteer Card for travel insurance. This card provides emergency medical insurance, baggage delay, emergency evacuation and more. Register with the Department of State. Call your credit card company and inform them that you’ll be leaving the country. They may freeze your account if you try to use your card in Honduras. Write down emergency contacts. Use our packing list to get your suitcase ready! Remember to pack light, but also to be prepared. Two essentials: bug repellent and sunscreen! PASSPORT and photocopies! Triple check to make sure you have it, and that it is valid for AT LEAST 6 months after the date you are to return to the US. We encourage bringing crisp,new cash in small bills (worn out bills are not accepted in Honduras) and only to use an ATM card in an emergency. ATMs are notorious for information theft. 6 days worth of work clothes to get dirty in! There is laundry at the hotel, so pack light. If you have extra space in your suitcase, consider bringing elementary level books, school supplies and used soccer equipment for the children we work with. Click here to see a complete list of items that are specifically requested. Long pants are required at the worksite. Please visit CDC’s page on traveling to Honduras and learn about the vaccinations and precautions you can take to stay healthy during your trip. SHH does not require proof of vaccinations. Your choice to vaccinate or take precautionary medications will be up to you and your family. However, you will be on a work site so we do recommend you are up to date on your tetanus short! Malaria is not very common in the area where we work, but it is up to you to decide whether you want to take malaria pills or not. At this time the CDC states that Malaria is not present in San Pedro Sula and Tegucigalpa (You will be about 1 hr from San Pedro Sula). Keep in mind Malaria medications tend to have very serious side effects and are not usually recommended for a very short, 8 day trip. The Department of State strongly urges Americans to consult with their medical insurance company prior to travelling abroad to confirm whether their policy applies overseas – which is the case only rarely. Book your flight with a popular flight website. Make sure your final destination in Honduras is San Pedro Sula (airport code: SAP). Please arrive on the first day of the trip date and leave on the last day of the trip. If you are in a situation wherever you may have to come earlier or leave a day later, we do have Airport Pickup and Guest House Fees. Any flights that arrive outside of the hours of 10am to 7pm, we ask for a $25 transportation fee. For overnight stays, you are welcome to do at a rate of $50 per day. Fill out our mandatory flight information after purchasing your flight. As soon as you have purchased your flight, fill out the mandatory flight form. The deadline is 14 days before the start date of your trip. This is to ensure the safety of volunteers and guarantee SHH Staff will pick up volunteers at the airport. Please email trips@shhkids.org for questions. If for some reason a change occurs DURING your trip, please email us at trips@shhkids.org to inform us. Navigating the airport in San Pedro Sula. After you arrive, you will go through immigration, baggage claim, and customs. Once you find your bags, SHH staff members will be waiting for you with a big sign. Once everyone on your bus shift arrives, staff will take you to the Villa Soleada Guest House. volunteers as possible. However, we also put a lot of time and resources into preparing for your trip, so last minute cancellations often incur a substantial cost for SHH.Therefore we have the following policies regarding cancellations that we believe are the most fair for our volunteers and the organization’s budget. Apply for a refund here and please be sure to include your registration information, including your fundraising page, billing address and transaction IDs. Once we’ve received your request, we’ll process your refund (if you qualify for one) and send you a confirmation within couple of days. If you cancel before putting down deposit. We do not consider you registered if you haven’t put down your deposit. Therefore if you select pay later when you register and do not put down your $150 deposit then you can cancel at anytime. Remember that to get the early registration discounted rate you have to put down your deposit to qualify. If you cancel after putting down your deposit (more than a month before the trip, see below) we are unable to refund the $150 but it can be transferred to a future trip. You must re-register before the early registration deadline in order to get the discounted rate. Putting down your deposit on an earlier trip doesn’t qualify you for the discounted rate without the registration. Unfortunately if you cancel less than 1 month before your trip you will not be able to use your deposit for a future trip*. Once you put down your deposit we expect that you are coming on the trip and therefore we dedicate resources towards preparing for your arrival. We will have to use that deposit to recoup the expenses made in preparing your spot. If you register for another trip then you will have to put down another deposit. Q: How do I create a user account with SHH? If you are ready to register for a trip you can go to www.shhkids.org/trips and register for your trip. A few minutes after registering you will be sent an email with your username and password. Q: Can donations made on Fundraising Campaigns go towards my volunteering trips? No. We strictly use our campaign funds towards our projects. Any donations made towards your fundraising page or a project campaign are NOT transferable towards your trip. However, upon registering for a trip, you’ll be provided with an option to create a fundraising page for your trip as well. Feel free to share your trip Fundraising page with your friends and family and raise funds for your trip. Q: What is the policy on cancellations? Please see our Cancellation Policy section above. Q: Is my trip tax-deductible? Yes. The IRS states that you can claim a charitable contribution deduction for travel expenses necessarily incurred while you are away from home. Since the trip fees cover necessary lodging, meals and construction site expenses you can deduct the full amount you paid towards the trip. Also, 100% of your airfare is tax-deductible! We recommend consulting your accountant or tax advisor before filing but this IRS document may help for those that file by themselves. Click Here. Q: Can I arrive before or depart after the trip dates online? Please purchase a flight to Honduras on the EXACT DATES of your trip. If you come early or leave late, you are responsible for contacting us trips@shhkids.org. SHH charges a $50 fee per day for hosting volunteers for extra dates before or after your trip date. Please look above at our Preparations and Packings List section above. Q: Will the internet or international phone calls be available? Yes. You will have internet access at the guest house, but it will not be all the time. You can also make international phone calls from any Honduran cell phone with a local phone card for a few dollars. Your SHH Trip Leader will have a phone for any emergency situations. Prepare to disconnect! Q: What if someone from my home country needs to get a hold of me while I’m in Honduras? Each group will have a leader with a cell phone. You can send that number to friends and family once you arrive. Before your arrival or on the day of, anyone can call us at +504 9637 3088 if they have an emergency. Q: Where will we be staying overnight? The majority of our volunteers stay in the Villa Soleada Guest House in Villa Soleada. The lodge has 24/7 security as well as all the necessary amenities including wireless internet and a laptop to share. On larger trips part of the group may stay at a hotel in El Progreso, such as Hotel La Cascada, a secure and gated hotel comprised of numerous air-conditioned cabanas. No matter where you stay laundry service is available. Q: Where can we get water while down in Honduras? SHH will provide purified water 24 hours/day during the trip. If you want to buy your own water, you can purchase purified water for about two Lempiras (ten cents). Please bring a water bottle to Honduras. Q: Should we bring food on the trip? If you have certain dietary needs, feel free to bring food on the trip. Most people bring energy bars or other snacks and carry them in their backpacks. Please make sure to let us know about any dietary restrictions when registering so we can prepare and notify our cooking staff. Q: How will we be traveling during the trip? SHH has its own bus and works with a professional bus driver who is available 24 hours during the trip. Q: What would I be spending any extra cash on? You may spend money on snacks, drinks and souvenirs during your trip. Most souvenirs, such as wood carvings, paintings, and handbags might cost around five dollars. Bring small denominations of crisp cash. Q: Is it safe to bring equipment such as laptops and digital cameras? Many volunteers bring electronics with them to Honduras. If you leave your gadgets in your room, you shouldn’t have any problems. You will have access to a computer and WiFi at the guest house or hotel. We encourage you to leave as much as you can at home. Q: What is the dress code in Honduras? Most people in Honduras wear clothes similar to what people wear in the US. Hondurans almost always wear pants and rarely wear shorts. We’d like to note that our Worksite Attire is different than off-site attire. Our Worksite Attire is shoulder cover shirts, long pants, and toed covered shoes. Q: Do we need to speak Spanish to go on a trip? Absolutely not! We provide translators 24 hours a day during the trip. There will be a good mix of non-Spanish speakers and fluent speakers in your group of volunteers. Q: Do we need a visa to travel to Honduras? For US citizens, a visa is not required. However, travelers’ passports must not expire for at least 6 months from the date of entry into Honduras. People from other countries may or may not need a visa to enter the country. Please check with the Honduran Embassy before departure. A good website to find out more on visas to Honduras is honduras.visahq.com. Q: What do I do if I get sick or injured? The first thing you should do if you get sick or injured is to tell a staff member. If necessary, a staff member can take you into town to purchase the needed medication or visit a local clinic. We also recommend taking a morning or afternoon off from the construction site if you are feeling particularly weak or dehydrated. For minor injuries, a first aid kit will be available for trip participants’ use at all times. Q: What happens if I lose my passport? Each participant is required to bring two photocopies of their passport to Honduras, one for him/her and one for the SHH staff. In the case that a passport is lost, you will be brought to the US Embassy in Tegucigalpa where they will ask for a copy of your passport and possibly a copy of your birth certificate (which would have to be mailed from the US). This could take up to a week, so be sure to avoid this situation by keeping your passport in a safe place in the hotel. Q: What should I do if people ask me for money or gifts? SHH prohibits participants from giving monetary gifts to the communities that we work with. This is because we do not want to create dependency or instigate conflict in the community due to preferential treatment of (or toward) and any one individual. If you choose to give a gift (for example, for a child’s birthday), we ask that you consult with an SHH staff member before doing so. Q: Am I allowed to bring a pet on the trip? No pets are allowed on SHH service trips. The only exception is guide-dogs or assisted-living pets.